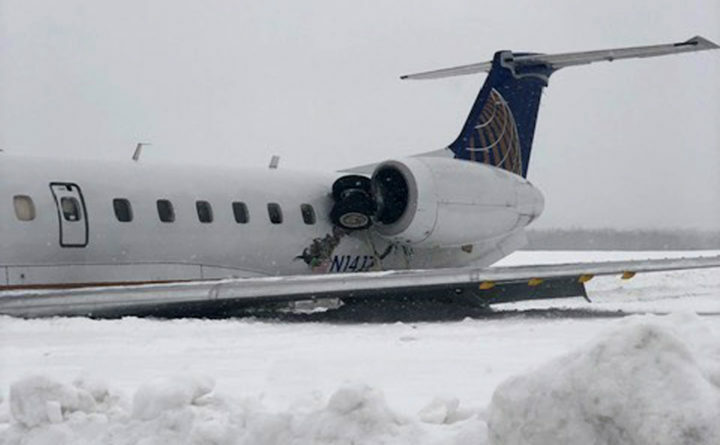 A United Express regional jet that slid off a runway during a snow storm is seen where it came to a rest at Presque Isle International Airport on March 4 in Presque Isle. One week after a landing accident halted passenger travel to and from the Presque Isle International Airport, a timeline for resuming travel remained unclear, but United Airlines has vowed to assist affected flyers until the airport reopens. On about 11:30 a.m. March 4, a 50-seat Embraer 145 jet operated by CommuteAir for United Airlines made its second attempt at landing and slid off the runway at Presque Isle International Airport, leaving several people with minor injuries and badly damaging the plane. In the days that followed, the National Transportation Safety Board started an investigation and had the plane removed from the scene. Terry Williams, a spokesman for the National Transportation Safety Board, said the agency will likely have a preliminary report on the incident released within 10 days, although this will not have an analysis or a determination of cause. The full investigation and its report will be complete within a year, he said. Meanwhile, it remains unclear when passenger travel will resume at the airport. Freight planes resumed flying the day after the accident, but neither local officials nor United Airlines could offer a timeline for passenger flights resuming. Kim Smith, public information officer for the city of Presque Isle, said that the airport did not know when passenger flights could resume and did not have any further information as of Monday. Following the accident and passenger air shutdown, United Airlines has offered affected customers a travel waiver that currently covers travel dates through March 15. A United spokesperson said the waiver will be extended until the airport reopens. Under this offer, posted on United’s travel notices page, change fees and differences in fare will be waived for new United flights departing between March 4 and April 1 between the same cities. The waiver also states that for rescheduled travel departing after April 1, the change fee will be waived but a difference in fare may apply. United Airlines, through CommuteAir, has served Presque Isle with daily flights to and from Liberty International Airport in New Jersey since July 2018. The United service replaced PenAir’s service to Boston under the federal Essential Air Services program that subsidizes air travel in rural communities. United Airlines receives a $4.78 million annual subsidy for the service, which provides 12 round-trip flights per week, under a contract which runs through June 2020.